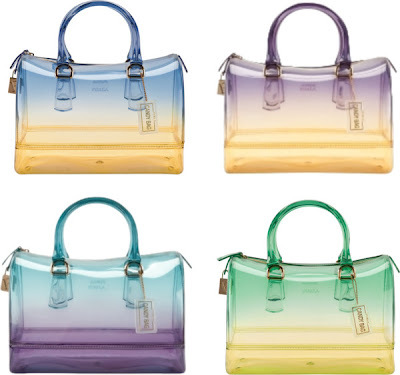 With its sleek, ombre design and see through charm, the FURLA CANDY SUNSET is the new edition of the original best-selling CANDY bag. Honestly, I never did get my hands on the original Candy bag. At the time, I just wasn’t satisfied by the colours available – none of them really tickled my sartorial fancy. Having already had a play around with the SUNSET bags in London, however, I can say that the ombre colour scheme is nothing short of a sheer stroke of genius and I’m certain it will be their most popular selling Candy bag to date (but then again, I naturally gravitate towards anything ombre so my view is could be biased). I must admit, the CANDY range definitely isn’t for everyone, especially as any passer by can see the exact contents of your bag. Personally, this would encourage me to keep my bag in a presentable state, i.e. less receipts all over the bottom, tissues, pens…you can imagine. The release of the CANDY bag coincides with the Candybrissima world tour, a travelling art installation performance which has already visited fashion capitals such as Milan, Paris and New York. In Singapore, local art students and designers will be able to construct their own Candy Bag from scratch, as well as add personalised touches. The showcase, held at Paragon Atrium, will be open to the public in Singapore on the 24-25 of May – so put the date in your diaries! I'm definitely saving the date! Wish I saw you at the event!